Trehalose-6,6-dibehenate (TDB) is a non-toxic synthetic analogue of trehalose-6,6-dimycolate (TDM, also known as cord factor), which is the most studied immunostimulatory component of Mycobacterium tuberculosis. TDB is an effective adjuvant for Th1/Th17 vaccination. TDB was found to rely on Mincle, Syk and Card9 for its adjuvant activity . TDB is a poorly soluble compound and thus was formulated with Kolliphor® HS 15, a potent low-toxicity non-ionic solubilizer, to generate TDB-HS15, which is particularly suitable for in vivo studies. TDB-HS15 is a strong activator of NF-kB in a Mincle-dependent manner. Kolliphor® HS 15 (former tradename Solutol® HS 15) is a registered trademark of BASF. 1. Schoenen H, et al., 2010. Cutting edge: Mincle is essential for recognition and adjuvanticity of the mycobacterial cord factor and its synthetic analog trehalose-dibehenate. J Immunol. ; 184(6):2756-60. Responses to M. tuberculosis-derived ligands. 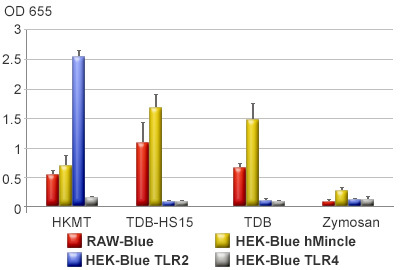 RAW-Blue™ cells, and HEK-Blue™ hMincle, HEK-Blue™ TLR2 or HEK-Blue™ TLR4 cells, which express the human mincle, TLR2 or TLR4 gene, respectively, were stimulated with 10 µg/ml of M. tuberculosis-derived ligands. After 24h incubation, NF-κB activation was assessed by measuring the levels of SEAP using the QUANTI-Blue™ assay.